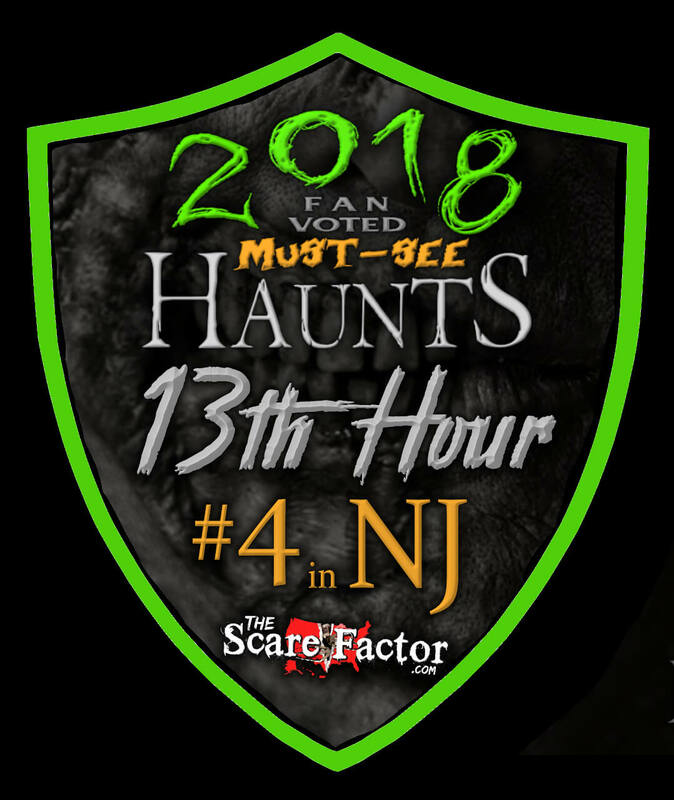 13th Hour Haunted House is a Haunted Attraction located in Wharton, NJ. Team Hallowoosh reviewed this attraction on September 23, 2016. The Haunted Scarehouse brings you “Two Floors of Fear” as they state clearly in their logo. That is their logo we are talking about. Not their tagline or headline from some newspaper, their symbolic icon is imprinted with the words that make sure you understand they have TWO Floors of Fear! 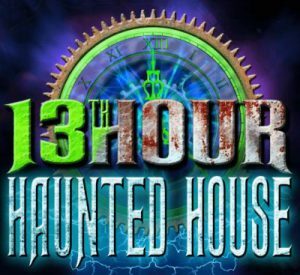 After going through The Haunted Scarehouse, you will quickly understand why they should be calling it “Two Floors of Non-Stop Heart Pounding In Your Face Fear… With a Side of Hell YEAH!” But that’s way too many words for a logo. Located in the Wharton, NJ Industrial Park on West Dewey Avenue, The Haunted Scarehouse is celebrating it’s fifth season in 2016. Your night doesn’t have to end with the haunted attraction as they now offer multiple escape rooms for only five dollars each. Join Dr. Lazarus in his ongoing investigation into the 1967 gruesome mysteries of the Hayden family; a scene of unspeakable horrors that were uncovered after Hurricane Doria destroyed the Hayden homestead and uncovered countless bodies. The Haydens were never found or heard from again. Dr. Lazarus will take you back in time using his giant time machine to explore the terror that resided in the home that once stood on the very ground you enter inside The Haunted Scarehouse. This year, you will have the opportunity to save one of the Doctor’s scientists (if you can find the key) and win your money back! Jane Murray manages around fifty to sixty actors a night. Besides the Doctor, his captured scientist and the few actors working the escape rooms, that is still a pretty big family. Upon exiting the time machine, you are unwelcomingly greeted by the first members of the Hayden family in somewhat of a dirty utility shed. They will roam and scare you as many times as possible as the door keeper let’s small groups in one at a time. Air horns and dark windows are only a few of the tactics they will use to keep you on your feet while you wait. Once inside, it feels like all Hell breaks loose with actors lurking and hiding around every corner and crevice. From the tiniest little girl character to the biggest, smelliest butcher, you will be attacked from all angles in all different sizes very early in the show. For the majority of the rest of your stay, it seems that everyone does have a place and purpose, including mechanics laughing with power tools and a psychopathic girl laughing and screaming in a giant cage that damn near crushes you. What impressed me was her ability to treat it like a jungle gym hanging and swinging all over the place. A crazy doctor in the attic can (and will) attack you at multiple points. While you are running away from him choking out one of his patients, someway, somehow, he pops up in front of you again. The cast knows where, when and how to hit their victims at every turn. The story of The Haunted Scarehouse takes us back in time to 1967. But, you are in a haunted house, so don’t go looking for go-go boots and turtleneck sweaters. You can, however, expect to see all of the actors sporting a costume from head to toe, as long as they have toes to show. The impression is always present that these are deranged characters stuck in a house getting bloody and dirty every day. The only masks I can recall were in the waiting area and they weren’t even your typical drug-store brand masks. Almost every other character in the attraction was completely decorated to fit the bill of their scenes. It is very hard to miss the entrance and parking for The Haunted Scarehouse. Going west, you can’t miss the giant 10×10, green, “Haunted House” sign on the left with a huge, open exit off the road. Before seeing signs for where to park, you will see the building that houses the attraction… mainly because a big banner with a creepy witch is draped over the side (oh yeah, and it screams “Haunted Scarehouse”). By the time you park you know exactly where to go. The ticket booth is actually an old school bus, but there is no mistaking it. A well-lit platform walking up to the windows with a “Tickets” sign is almost embarrassing to miss. I had the pleasure of meeting owner Steve Bailey for a minute as it was a busy first night, but he still took the moment to shake a hand and welcome me. David Boyle was operating the grounds outside and gave me some great information on the history of the haunt as well as the movie he wrote and directed on site (“Abandoned In The Dark” starring Kane Hodder). Halfway through the covered waiting area is a little white shack with a photo booth inside. Unlike most photo ops in haunted attractions, these guys direct you into a fun pose to show all your friends. And, also unlike most photo ops that give you a photo ticket, Haunted Scarehouse uses a chip card that you hold onto until the end of the attraction. Maybe a third of the way into the haunted house, an actor will ask for your card “in order to pass,” but it’s really a second photo op inside the attraction! At the end, you can hand in your card and they will show you the pictures. $5 will get you the photo sent to either your e-mail or Instagram. When you exit the haunt, you can treat yourself to some drinks and candy or some amazing chocolates from Lekker Chocolates made just for The Haunted Scarehouse. Chocolate Oreo Brains and fingers are just a few of the delicious treats you can purchase to complete your evening. Everyone at the haunt is very friendly and courteous. Even some of the monsters were able to help the children through who were too frightened. Like many haunted attractions, Haunted Scarehouse is loud enough even without being inside a warehouse. The horns and screams and saws and music run non-stop. You might have a good idea of what may be coming, but you will not know when or how. The sets are professionally well done and make you feel like you are really in an old, disgusting house. The time machine concept was a clever way around the clear fact that you are inside a warehouse. I was most impressed with the waiting area outside the Hayden family house after your time travel experience. You really do come out of a shed and into the front yard of this gruesome, sick family’s home. The details to the walls really put me in the story. Without giving too much away, the special effects inside The Haunted Scarehouse begin immediately with the time machine. Is it the most elaborate, mad scientist, mumbo-jumbo chamber you have ever seen? Probably not. In fact I would guess most people would be quick to assume the actual time machine is not the chamber they are standing in while listening to Dr. Lazurus. But, in my book, any attraction that actually introduces you to a storyline is rare and amazing. Lights will flash and the screens will show you enough to understand you are going back in time. Inside the house, you will be treated to a plethora of effects. Giant dragons and mutated plants will try to eat you. You’ve probably seen a drop panel or two, but you’ve never seen one twelve feet long. My favorite effect is their famous “murder-go-round” room (just hold onto something and don’t fall down). And if you think you are face to face with swinging baby heads, you probably are. The Hayden family murders took place in the late 1960’s. Dr. Lazarus will teleport you and your fellow haunt attendees back to the house to find out what really happened in that house. Along the way, you will find crazy killers and even crazier victims screaming for your help. In some cases you might even find victims that have gone so crazy they are now part of the family. This year, at the very end of the haunt, you will be directed to find a key to unlock one of the scientists that has been captured. Although, you only have about twenty seconds to do so. The murder-go-round room did not fit the bill of an old, rotten body-infested house, but it was too much fun. The bottom level of the attraction does a good job at keeping the theme of an old haunted house. The attic, on the other hand, while just as scary, seemed to abandon themes all together. In the second floor attraction, you will run into more than one hospital-style room and a short, but sweet, clown room. At one point you walk through a closet of old, ratty clothing and maybe some stored antiques, but I was too distracted from these random cartoon-style monkey props. I’m sure if you walk right into them, they’ll do their job but, for a seasoned haunt tourist, I try to make at least some sense of what I’m seeing. Despite the style and placements of some props and actors, the Haunted Scarehouse knows how to make you jump. From the big animatronics scaling the length of your group to the little children clawing at your feet, they do their job very well. There are plenty of places for the actors to hide and plenty of terrifying things to distract you from what’s coming next. Everything is a surprise at Haunted Scarehouse with some scares you may never see anywhere else. The actors know who to target and how to get them and the animatronics come in loud and fast for the best results. $25 for a general admission ticket that gives you a fifteen minute haunt and a ten minute time machine show makes this a great value. Even $5 for a digital photo of you and a scary witch creature is pretty good. The fact that they even offer a way for you to get your money back is well worth the trip! If the line is too long for you to wait, they offer a speed pass for $40. And not to mention again the 60-minute escape rooms for just $29 a person. And try to find me another haunt that offers homemade, custom, hand painted chocolates while you wait or for the ride home! 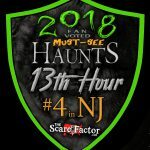 Ranked as the best Haunted House in New Jersey by Popsugar.com, Haunt Hunters, NJNew1.com, Scranton Review, and more, if you are looking for a great scare this October in Northern New Jersey, you will find it at The Haunted Scarehouse! Love coming here, but the clowns are overplayed. There’s no originality with them. I don’t think …show more it’s right for a clown to jump on someone’s back whether they have a glow stick or not. This haunt is great. Great sorry love. Great actors. Great everything. The wait was surprisingly …show more short for how many people were there. The added new attractions make this place even better year after year. Actors are great and enjoyable. They enjoy there job which makes it a better experience all the way around. This haunt was awesome and is my favorite place! I go every year! The staff is amazing, the que line …show more actors are fantastic. Overall, the haunt and the actors are awesome and try to scare you in every way possible. Every corner theres a new scare. The clowns are always my face though! :) Totally recommend this place to anyone who loves haunted attractions! It’s the best and I can’t wait to return again this year!